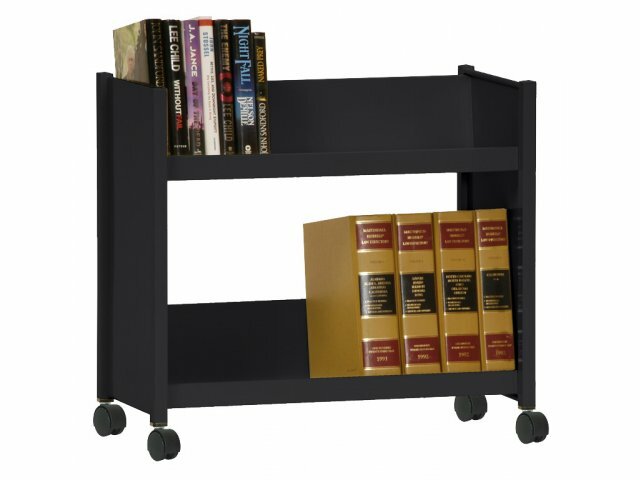 This double shelved mobile bookcase is designed with durability in mind. Made from a sturdy steel design, all joints are welded for extra long life. This unit features a pair of sloped shelves that are 9.5 inches deep. The depth allows you to store most large books, reference materials, video tapes, or other similar items. The shelves are also 27 inches wide, which enables you to fit a collection of heavy books on them. 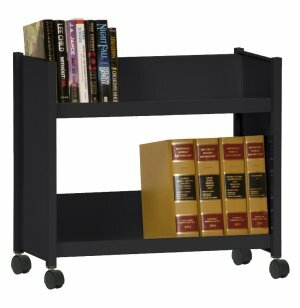 This sloped-shelf book truck comes standard with 4-inch furniture casters that are fine for carpeted areas. You can easily roll the unit even when fully loaded. Two sloped shelves are 9.5 inches deep and 27 inches wide.